7-day/6-night trip to Oahu Hawaii for 2 with hotel & airfare included, $300 travel money sponsored by Brian Butcher of Edward Jones (Avail. Jul-Oct), hairstyles for 2 by The Sassy Seale Hair Salon. 4-day/3-night stay & 2-day “Park Hopper” tickets for 4 (Avail. July-Nov), $350 travel money sponsored by Yuma Insurance, car rental by Avis. Full day of deep sea fishing for 4 out of San Diego. 1st night of accommodations aboard vessel , 2nd night of accommodation in San Diego for 4, $200 travel money sponsored by Republic Services (Avail. July - Oct.)$150 car detail by Express Auto, $175 auto service by Accurate Automotive,$50 fuel card. 3-day/2-night stay for 4 in San Diego, admission for 4 to Sea World and Wild Animal Park, $300 travel money,$50 fuel card, sponsored by 1st Bank Yuma (Avail. Aug.- Nov.) car rental by Avis. 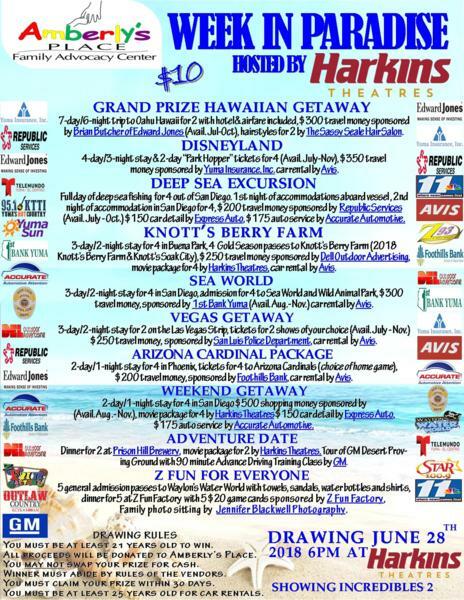 3-day/2-night stay for 4 in Buena Park, 4 Gold Season passes to Knott’s Berry Farm (2018 Knott’s Berry Farm & Knott's Soak City), $250 travel money by Dell Outdoor Advertisement, movie package for 4 by Harkins Theatres, car rental by Avis. 3-day/2-night stay for 2 on the Las Vegas Strip, tickets for 2 shows of your choice (price restriction apply) $250 travel money sponsored by San Luis Police Department, car rental by Avis. Dinner for 2 at Prison Hill Brewery, Tour of GM Desert Proving Ground with 90 minute Advance Driving Training Class by GM. movie package for 2 by Harkins Theatres. 2-day/1-night stay for 4 in San Diego (breakfast included) $500 shopping money sponsored by Yuma International Airport (Avail. Aug - Nov.), movie package for 4 by Harkins Theatres $150 car detail by Express Auto, $175 auto service by Accurate Automotive. 2-day/1-night stay for 4 in Phoenix, tickets for 4 to Arizona Cardinals (choice of home game), $200 travel money, sponsored by Foothills Bank, car rental by Avis.